NEW BRITAIN - The area girls soccer teams now know their paths to a potential state title. 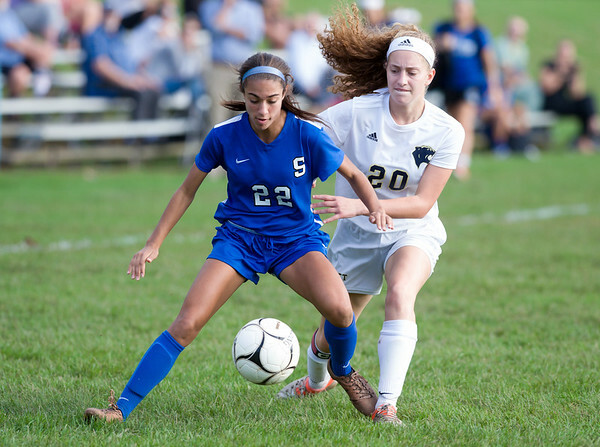 The CIAC announced the Class LL, L, M and S brackets Friday with seven of the New Britain and Bristol area schools - Southington, Newington, Bristol Eastern, Bristol Central, Berlin, Innovation and Plainville - learning their postseason paths. The Blue Knights finished the season with the best record among those second teams, going 15-1-0, and as a result, earned the No. 3 seed in the LL tournament as well as a first-round bye. Southington will host on either No. 14 Hall (9-4-3) or No. 19 Simsbury (9-6-1) on Wednesday at 2 p.m. The Indians, Lancers and Rams all secured spots in the Class L tournament. Newington (10-4-2) has the highest seeding of the three at No. 11 and will take on No. 22 Guilford (5-5-6) at home on Monday at 3:30 p.m. If the Indians win, they’ll face sixth-seeded Masuk (12-3-1), which will be coming off a first-round bye. Bristol Eastern ended the regular season with a 7-6-3 record and the No. 18 seed in the tournament. The Lancers will face No. 15 Lauralton (10-6-0) on the road on Monday at 2 p.m. with No. 2 Tolland (14-2-0) waiting should they win. Bristol Central, meanwhile, earned the 25th and final seed of the bracket. The Rams (6-9-1) will face No. 8 Bullard Havens (10-3-1) on the road on Monday at 2 p.m. If Bristol Central wins, it will take on either No. 9 Naugatuck (10-3-3) or No. 24 Avon (6-9-1) in the second round. Three area teams also qualified for the Class M tournament. The Redcoats - last season’s Class M runner-up - will be the 18th seed after a 9-6-1 regular season. Berlin will take on No. 15 Holy Cross (9-3-4) on the road on Monday at 2 p.m. Granby (15-0-1), the No. 2 seed, awaits the winner of that match and will be coming off a first-round bye. The Ravens (7-8-1) come in as the 22nd seed and will play at No. 11 Stonington (11-4-1) on Monday at 2 p.m. If Innovation pulls off the upset, it will take on either No. 6 Notre Dame-Fairfield (12-2-2) or No. 27 New Fairfield (6-9-1). The Blue Devils (5-6-5) enter the bracket as the 23rd seed. They take on No. 10 Weston (11-3-2) on the road at 6 p.m. Monday with a meeting against either No. 7 Wolcott (11-1-4) or No. 26 Valley Regional (6-8-2) in the second round should they advance. Posted in New Britain Herald, Berlin, Goodwin Tech, Innovation, New Britain, Newington, Plainville, Southington on Friday, 2 November 2018 22:28. Updated: Friday, 2 November 2018 22:30.